Founder and Principal Designer of Kate’s Blossoms, Kathleen (Kate) Cage began floral design at a very early age. Both her parents were raised on working farms, one in Southwest Virginia and one in the Pacific Northwest, and this farm to table way of living never departed from the manner in which they raised the family. Chickens and eggs, fishing and shell fish gathering, an orchard of fruit trees and berries, and springtime to very late autumn vegetable gardens, were included in Kate’s daily way of life. The elements which most caught Kate’s eye, however, were the flowers which her parents and neighbors planted in each and every patch of dirt they could fill with year round color and texture, as well as the woodland acreage behind her home, which Kate would explore with her cats. Kate’s Dad cut trails through these Pacific Northwest woods, for Kate and her cats, so they could explore and pick the ferns, moss, trilliums, mushrooms, and evergreens. There were also owls, deer, bears, and cougars back there, but that’s a whole other story. Kate got her start in this industry with the design of yearly May Day baskets and holiday centerpieces for each of her neighbor ladies’ homes, and with her brother, selling veggies and bouquets from a roadside produce stand. 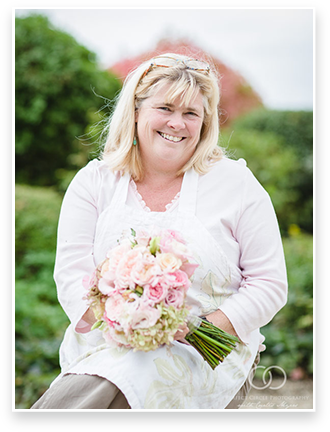 Kate designed her first wedding when she was 16, and has been a professional floral and event designer since 1990.